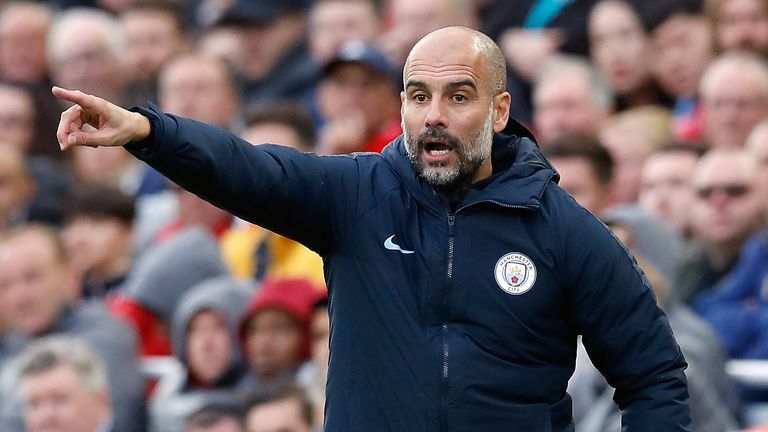 Pep Guardiola is often praised for producing entertaining football but the Manchester City boss is arguably the best defensive coach in the world too, writes Adam Bate. It is almost two years ago now that Pep Guardiola risked ridicule with his remarks following Manchester City's 4-2 defeat to Leicester City. "I am not a coach for the tackles so I don't train the tackles. What I want is to try and play good and score goals. What's tackles?" It was the sort of comment that serves as a red rag to fans of rivals in red shirts. But even to the wider public it helped to fuel the image of Guardiola as a naïve figure who not only underestimated English football but fundamentally misunderstood its nature. Pick the 6 highest scoring players in this week's featured match. That opinion was not restricted to these shores. The great Argentine defender Roberto Ayala once accused Guardiola of damaging football by taking the emphasis away from defence. There were those at Bayern Munich agitated by his commitment to a certain style of play. Andre Villas-Boas, a man not exactly renowned as a savvy pragmatist himself, said upon his arrival in England that the Barcelona approach would not work in England because of the higher risk of losing the ball. As Yaya Toure put it: "His way is to attack, not to defend." But there is a risk here of missing the point. Not coaching tackling does not mean not coaching defending. Focusing on how to construct attacks doesn't mean ignoring how to defend the opposition's attacks. It is all part of the whole. Guardiola's way of attacking is a way of defending. Firstly, let us acknowledge the blindingly obvious. Guardiola's way works. In each of his first seven seasons in top-flight management - four of them with Barcelona followed by three more with Bayern - his teams had the best defensive record in their league. His Manchester City side repeated the trick last season. The result? Guardiola has had the team with the best defensive record in the league more times than he has won the league. Think about this. He has had the best defence more times than he has had the best attack. It might be counter-intuitive, but on these numbers alone, it would not be outrageous to regard Guardiola - the man who doesn't coach tackles - as a defensively-minded coach. Even in his initial presentation upon being named as Barcelona coach back in the summer of 2008, he spoke of the desire to build a "solid and balanced" team. Privately, in his first meeting with the players he talked of "order and discipline" as being his priorities. It took some time for that control to become apparent at City but it is obvious now. Guardiola's team have gone eight-and-a-half hours without conceding a goal. It's not luck. The underlying numbers reveal how the opposition have been starved of opportunities. City have conceded the fewest goals, the fewest shots and the fewest shots on target. Delve deeper into Opta's expected-goals model that tracks the overall quality of chances and it becomes clear that City are by far the best defensive team in the Premier League. That model suggests that the chances City have given up are likely to have resulted in fewer than four goals - as indeed they have. For every other team that number is at least six. For the ninth season in 10, expect Guardiola to finish up as the coach of the team with the league's best defensive record. "I like to have a clean sheet but I know that a clean sheet is not just as a consequence of the back four," Guardiola once said. Nothing unusual about that. All coaches talk of the need to defend as a team. What causes the confusion is the way that City attack as a team too. The quality of their build-up play encourages opponents to retreat into a deep defensive block or risk being passed around and picked off. Opta's advanced metrics highlight just how successfully City are able to get the ball up the pitch in each sequence of play. On average, they progress the ball further with each sequence of ten passes or more - 18.2 metres to be precise. Moreover, City have an average of 74 such passages of play that either reach the opposition box or end in a shot - twice as many as any other team. The consequence of this ability to dominate games is that they make it so much harder for the opposition when they have the ball. City's opponents are not only more tired when they win it back because they have so little possession but they are also deeper when they get it. In contrast, City are already up the field when they win it. Opta's advanced metrics also reveal that their sequences start higher up the pitch than any other team. For Guardiola, playing this high-pressing possession game becomes a virtuous cycle. "We play in the other team's half as much as possible because I get worried when the ball is in my half," he once said. That too is reflected in their approach. After some difficulty in dealing with the counter-attack in his first season at City, that issue has been addressed. In part, it is due to the acquisition of younger and quicker defensive players. It is also due to how well drilled City are in preventing the counter-attack. Do not be fooled by the fact that they have committed the fewest fouls in the Premier League. It is misleading. When it comes to the number of fouls per successful opposition pass, a different picture emerges. Only four teams allow fewer passes before committing a foul. Only two teams allow fewer passes before making a defensive action. City stop teams breaking on them. It is not a new idea. It is one that Guardiola has been honing over more than a decade. This year could even be his best yet. After five consecutive clean sheets, the prospect of challenging the Premier League record of 15 conceded in a season cannot be ruled out. That record, of course, belongs to Jose Mourinho and his first Chelsea team. Their reputation for defensive excellence was well earned. But maybe a truer picture of Guardiola's coaching ethos is also beginning to emerge. Pep Guardiola.is a defensive genius.